Banner Displays: (2) Banners, 27" x 82"
These banner displays are a double banner version of our adjustable, water filled base banner stands. Instead of just one custom graphic, we offer these banner displays with 2 printed banners, facing back-to-back and forming a triangular display. With two graphics, you can set up your display stand just about anywhere and have it draw attention from either direction. 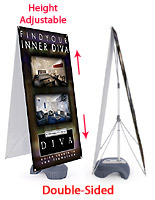 Like other adjustable banner systems, these banner displays can be used indoors and outdoors. One of the most appealing features of these banner displays is their pole and bar length flexibility. 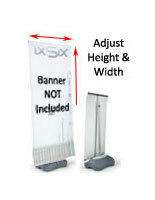 These double banner displays are held to the base with a middle pole that adjusts up and down according to the height you need. 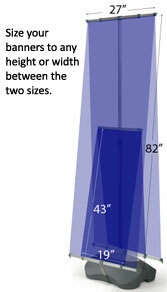 By extending the pole, your vinyl banner remains taut, regardless of its length. 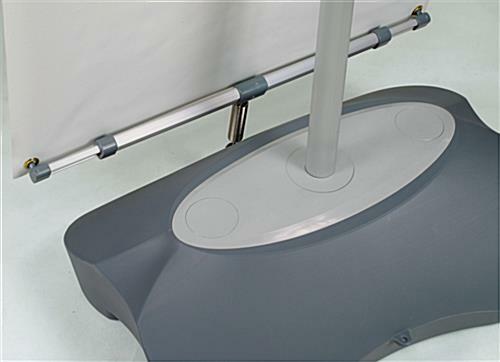 Like other banner stands in this product line, these banner displays attach vinyl banners to horizontal bars on both the top and bottom with hooks; simply hook bars through the grommets on the banners. These double sided banner displays differ from our single banner systems because they contain one additional horizontal bar with hooks at the bottom to hold the second banner. Like the middle pole, these aluminum bars can also extend to accommodate various banner widths. 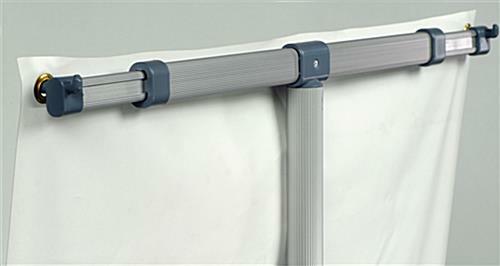 High elastic springs connect the horizontal bar to the water filled base to lessen the impact of strong winds.Keep in mind that, as with all banner stands, these banner stands are not undestructible and may run the risk of being blown over in winds. Please use your own discretion. 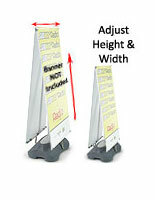 Buy these adjustable banner displays to make setting up your display easier on you. Banner systems such as these banner displays are built with the traveling customer in mind because they are easy to set up and breakdown. 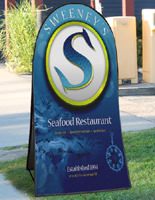 Lightweight and portable, the banner displays can conveniently be positioned in almost any environment. 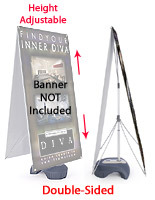 These banner stands also take up less than 2 feet of floor space, working well in small display areas. Base: Holds 6 gallons of water. An in-stock lead time of 2 business day(s) begins after the artwork proof has been approved. Product does NOT ship on a same day basis.